There is quite a lot of wear and a huge tear in the robe I’m mending for one of the monks at the moment. I really enjoy the challenge. The cuffs, hem, collar and under arms are the most vulnerable areas for fraying and ripping. Sometimes material from a hem can be cut out and used to make a new collar thus giving the robe literally years more usable life. But one can only go so far. A hem can only be mended so many times before the whole thing is too short, cuffs likewise. Then there are stains to deal with. Oil, grease of any kind and paint are the worst although bleach stains, in the wrong place, can spell the end without any question. When one wears the same thing day in and day out it’s hard to retire it. My late Master would say with a kindly chuckle, You can take loyalty too far you know, when she’d see a monk walking about in robes well past retirement age. 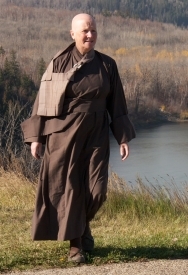 As a young monk I’d mend and patch for the senior monks who were too busy to do it themselves. I knew they would wear what they had into threads and when caught early enough I could extend its life considerably. However those older monks would take a lot of convincing when the moment really had come to hang up that robe for the last time. The one I’m dealing with at the moment will be good for a few more years when I’ve finished with it. Hurrah! I’m thinking of robes because they are so closely associated with their inhabitants. After my Master died, eleven years ago to the day, I inherited one of hers. Having remade it to fit me, I wear it. Sometimes I think I wear it for her. When it’s time has come though I’ll be washing windows with it. You can take loyalty too far! I guess it is all about letting go even with the robes… or that which is associated with them. Or sometimes moving out from your comfort zone to experience new. Was not the Buddha’s first robe, one of many scraps made into one robe which I always thought was great way of showing a representation of people in the world, the pieces apart yet are the same, together but not. Thanks Mike. I’d not thought of the kesa with that idea in mind, interesting. I like the subtext of this post. I like the idea that a kind soul can help us notice our habits that could use a little attention and I’m appreciating right now the truth that we can acknowledge and borrow the habits of others (i.e., our teacher’s) and then when the time is right, let them go. Thanks always for your gentle teaching, Rev. Mugo.